I want to share a fun story about my recent run this past Saturday. Now, those of you who live in Colorado will all say that the weather out here is HIGHLY unpredictable. I saw that first-hand on Saturday. I was slated to run the Arvada Park-to-Park inaugural race with my friend JJ and my employee, Erika. 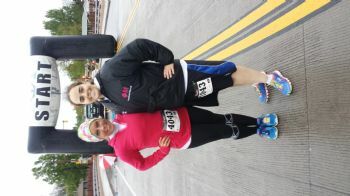 This was Erika's first 10k and the furthest she has ever run to date. I was going to do the half with JJ and just enjoy filling out my third half marathon since I moved. So, let me share what happened. I was nervous as ever because we were not having great weather the few days leading up to the race. I kept checking the weather reports and hourly forecast to see if there was going to be a change in the circumstances. It looked like there was going to be a break and I was going to be able to have a clear run. Fast forward to race day morning. 6 am wake up call from Erika that the half was cancelled because of the conditions and half the course was under water (from the barricades being over turned and what not). BUT, the 10k and 5k were both still on. Okay, I was down for a free 10k and this was going to be an opportune time to bond with my direct report. I was in. Why not? Sounded like a good idea. We arrive to the race site. It's cold. It's drizzling. It's not too bad (famous last words). We take off, run is going alright. About 2 miles in, TOTAL DOWNPOUR. We ran in freezing rain for mile 2, 3, 4, 5 and into part of 6 before it cleared up. Normally, I run about an 11 min pace for half marathons. We were pulling 14/15 min miles BUT a good teammate never leaves her buddy, so I stayed with my colleague. Prancing in front of her, coaching her along and telling her to push herself. She only walked a handful of times and I couldn't have been prouder. We finished at 1:28:33. Soaking wet. Shoes carrying water like river buckets. Can't feel our fingers or the tips of our noses. Miserable, but ACCOMPLISHED in the same respect. My colleague JJ praised me on staying with her and not taking off to finish. I couldn't have fathomed not running with her. She would have been all alone and going through the experience by herself, that is just silly.....what a missed opportunity that would have been for me if I let her do that. This was a chance I could spend some quality bonding time with her. This is not the first time I have stayed with my group when running. I've never been a competitive runner and I have come to realize that it is all about the experience in my eyes. I am not going to win any races anytime soon. I am not even going to place for my age and I am okay with that. it's about camaraderie, friendship, commitment and perseverance and that is what I have come to LOVE about running and why I enjoy signing up with friends. Crossing that finish line hand in hand with someone you know is an irreplaceable feeling. You can buy into a race and maybe get a medal, but the reward of seeing your 25 year old employee do something she never thought she could do (and I got to be part of that journey) is FAR better than any accolade I would ever win. That finish with her was worth the rain, the cold, the change of pacing, the wet Nikes, the constant chill that I couldnt shake, and all the misery of dodgy weather. Someday, when I am married or dating a guy, I would LOVE to cross a finish line with him, hand in hand, doing something challenging like a half or a relay or a full.